TrackMaster™ motorized trains from Fisher-Price take Thomas & Friends™ to greater speeds, taller heights, and bigger adventures! 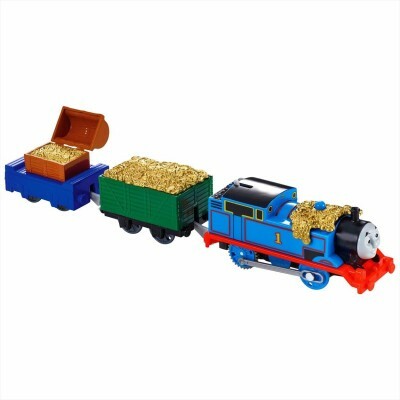 Inspired by the Thomas & Friends™ DVD movie, Sodor’s Legend of the Lost Treasure, Treasure Thomas shows the No. 1 blue engine like you’ve never seen him before, making him a really unique addition to your collection of toy trains! 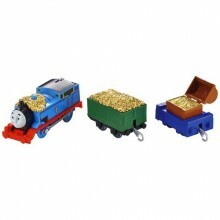 Covered with gold doubloons and hauling cargo cars full of lost treasure, this version of Thomas brings even more fun-filled adventure to your TrackMaster™ world! 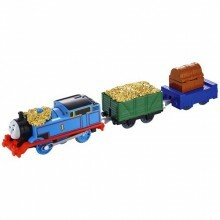 Collect all your favourite Thomas & Friends™ characters to build a motorized railway full of Really Useful engines! Children ages 3Y+. Requires 2 AAA batteries.